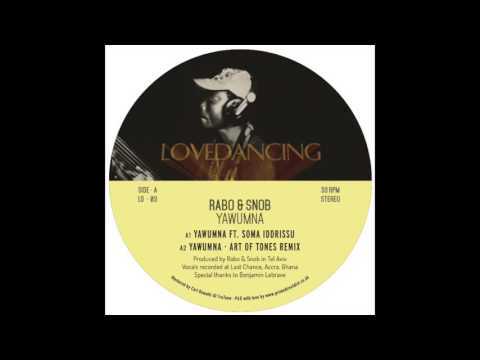 The fourth EP in Whiskey Disco spinoff Lovedancing‘s catalogue comes courtesy of Israeli duo Rabo & Snob (soundcloud) (themselves regular contributors to WD). R&S, which consists of DJ/Producers Obas Nenor and Eyal Rob, is best known for their sneaky re-edits of the global disco variety, often leaning heavily on Middle Eastern sample material. The Yawumna EP shifts the sonic focus to West Africa, building on a trip taken to Ghana and seamlessly integrating collaborations from local musicians. The title track, which sits on the first groove of the record (and was the target of many an ID request during Obas Nenor’s Boiler Room set last year) is a haunting mid-tempo groover featuring Soma. “Yawumna” mixes together a pulsating dark bassline with exquisite string (kora, to be exact) and vocal work. For our premiere today, we have French producer Art of Tones remix of the track. An increase in tempo and added afrobeat flair repurpose the cut for slightly brighter and funkier moods. It’s a slightly looser take, integrating an analog bassline, tasty rhythm guitar (wah-wah included) and playful, sustained organ riffs for added fun. On the B-side “Ifa” (featuring the vocalist Azizaa) is a slice of mean, afro-house badness, with Jacques Renault contributing a slicked out dub version. All of this makes for a nice package of two great originals and two purposeful flips from established vets in the house game. The Yawumna EP hits record stores on May 12th for those needing to scratch their afro house itch.